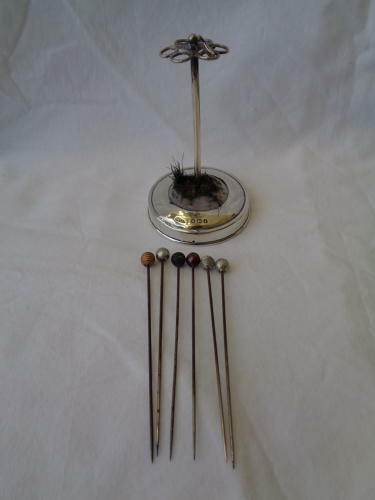 Antique Silver Hat Pin Stand with Six Antique Pins. Hallmarked Birmingham 1908 by maker Adie & Lovekin. Stand has some marks commensurate with its age. The Velvet in the base is completely worn but Original. The Pins have no hallmarks. Measures 8cms high by 5cms in diameter, Pins 7.5cms in length.